What I mean by that is you will be able to see in the first scenes of the film, just how it play out, even though the film wants you to believe it’s a twist. Well, it’s not. I enjoy watching Willis act in movies, but here, he has none of the charisma of his other films. It’s straight and narrow, which is unfortunate, because he could have had a ball here. On the other hand, there is a Hayden Christensen, who has basically been missing since ‘Star Wars‘ over fifteen years ago. Needless to say, I was excited to see him on screen. When one of the people kidnap Will’s son, all bets are off and we are supposed to believe that Christensen, as a finance man, is willing to go all Lord Vader on us and take out the bad guys. Not likely here, although I really like Christensen. Miller just hasn’t planned out the movie very well and was not capable of getting good performances from his actors. It’s a pity, because this movie would have been fun. 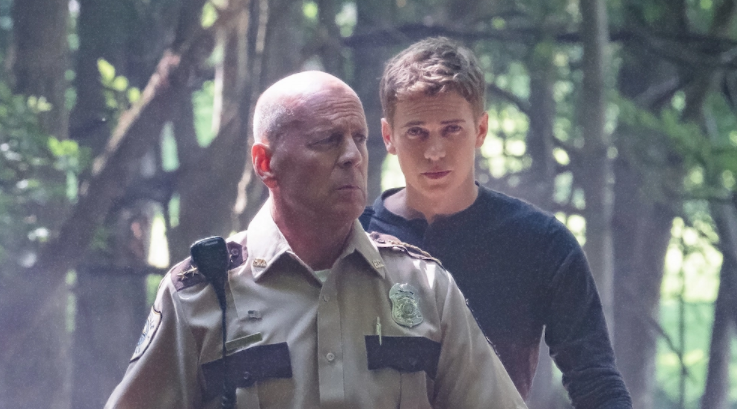 ‘First Kill‘ is still decent enough for a late night watch, but it won’t be memorable, with the exception of a pod race sequence, wait, I mean a four wheeler chase sequence in the woods. 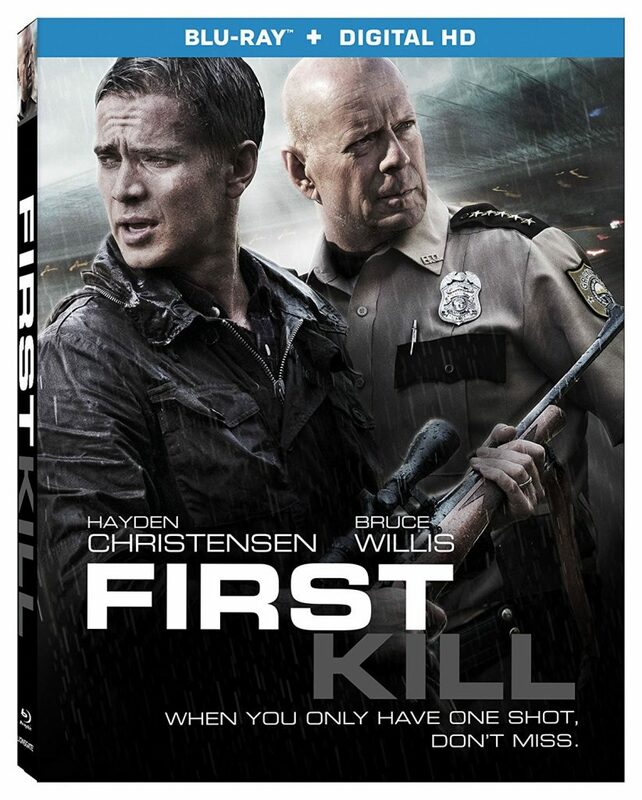 The Video: ‘First Kill‘ shoots its way onto Blu-ray with a 1080p HD transfer and is presented in 2.40:1 aspect ratio. Interestingly enough, the film has been heavily color graded with a high use of filters as well. A lot of the film has a greenish blue tint to it. Sometimes, the film can even have yellow tint to it as well, which all hinders certain details in closeups and wider shots. You’d think that filming outside, there would be enough ample natural lighting, but not here. It’s all for a stylistic effect that never really goes anywhere. It’s a rather dark film in tone and style, and the detail suffers from it in certain spots. In other moments, mostly in well-lit scenes, detail is sharp and vivid, which can be fun, because there is some very gory scenes and makeup effects that bring the blood. Other details looks good. Black levels are deep and inky and skin tones aren’t natural due to the filters. There were no major issues with banding or video noise though. The Audio: This release comes with a lossless DTS-HD MA 5.1 mix and is actually softer that I thought it would be. I expected a movie with tons of gunshots and action sequences to be explosive. It’s not though. Sure, the sound effects are loud, but don’t pack a punch like other films do. In fact, you might say, “was that a gunshot?” Not a good thing for an action film. It all feels like it’s been subdued for some reason. Other ambient noises sound good enough of wilderness sounds, but it’s not amazing. The score is the biggest sound here and always adds to the suspense of each scene, even though it’s a forgettable track. Dialogue is clear and easy to follow along with and free of any pops, cracks, hiss, and shrills. Audio Commentary – The director delivers a commentary track here as he talks about the story, the characters, and shooting on location. He is excited and proud of his film, which is nice to hear. I just wish I liked it more. Behind the Scenes of First Kill (HD, 12 Mins.) – The big action scenes of the film are looked at with some on-set footage and cast and crew interviews. This is EPK type of fluff. Cast and Crew Interviews (HD, 62 Mins.) – Over and hour interviews with the cast and crew, but Bruce Willis and Hayden Christensen are nowhere to be seen. Deleted Scenes (HD, 6 Mins.) – A few deleted scenes that don’t add any real value to the finished product. Theatrical Trailer (HD, 3 Mins.) – Trailer for the film. ‘First Kill‘ has some good concepts and some decent actors, but the execution of everything isn’t successful. You want so badly for this movie to be fun, but it borders on the cheese line and never really follows through. Also, it’s too wrapped up in trying to confuse us. Just keep in simple is the motto the director should have embodied. The video and audio presentations aren’t great and the bonus features don’t offer a ton of insight and the lack of Willis and Christensen in them is not cool. I hate to say it, but skip this one. This entry was posted on Sunday, September 3rd, 2017 at 3:29 pm	and is filed under Film, News. You can follow any responses to this entry through the RSS 2.0 feed. You can skip to the end and leave a response. Pinging is currently not allowed. « Varèse Sarabande Releasing ‘Christine’ Soundtrack LP On Blue Vinyl!! !